Like an artist, a yarnista will often sit and create when the yarn muse strikes. My artist offspring calls this "doodling" and can do it with eyes closed, while I can barely scrawl something vaguely sweater-shaped when trying to design one. For the yarnista, this habit is usually the result of discovering an object that is needed immediately. A laptop sleeve, for example. Yes, a laptop sleeve can easily be purchased at an electronics store, unless one does not want the sleeve to be solid black or red or bear the markings of whatever the current obsession of the laptop-toting world is. Purchasing a laptop sleeve is also a bad idea when one has repeatedly forgotten to measure the laptop before heading to the electronics store despite the dozens of tape measures lying around the home (not that I speak from experience...). And then came the turn. Yes, those weird ear-looking corners are the result of accidental decreases at the edges, where I was trying really hard not to accidentally increase. 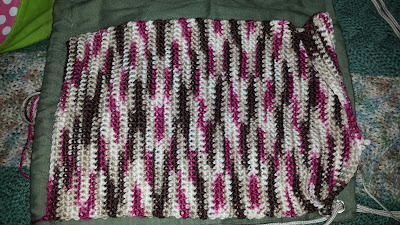 When I discovered that my laptop sleeve universe was collapsing on itself, I had the same sort of panicked thoughts as any other yarnista: "Gah! This is for my work laptop; I don't want it to like like some cartoon character! But, I don't want to rip it all out and start over, then I'd have to actually draw a design! Noooo! What do I doooo?!?!?" It is in these moments that we must remember to breathe, and perhaps say a calming prayer or mantra. I prefer "Llama llama llama ohm. 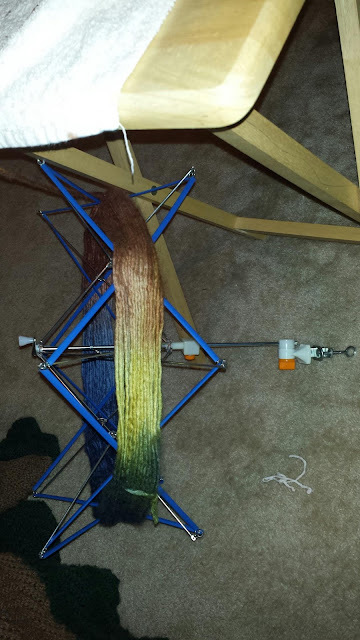 Yarn comes from llamas and resistance is futile," followed by a few deep breaths. 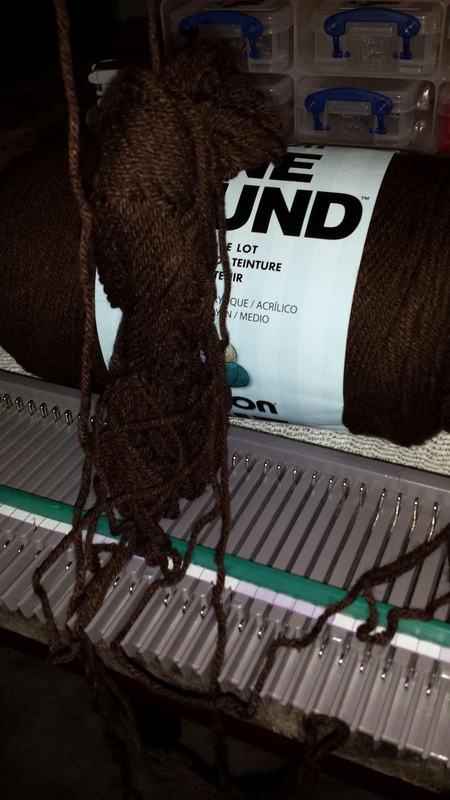 There are always options for fixing a yarn doodle gone awry. In this case, I had three options. One, I could rip it all out, start over, and perhaps crochet or knit it as a tube. Two, I could rip it as far back as the turn, count the stitches, and resume the turn, being cautious not to lose stitches. 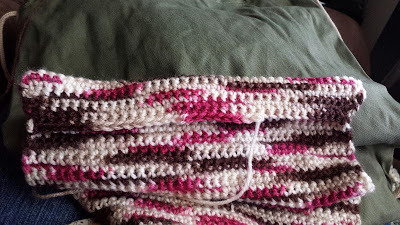 Three, I could rip it back as far as the turn, continue crocheting it straight, and just seam the edges together when it's long enough. I do not count the obvious fourth option of simply purchasing a laptop sleeve now that I have the dimensions recorded in my smartphone. A yarnista will not be dissuaded by a yarn doodle snafu! This gem was created when I tried to use the center pull strand from this Caron Pound of Love skein. Happy Sunday, folks. Yes, it flew off the table spinning in the air like a Texas umbrella.